The basis of daily time measurement is the relationship of the Earth's surface to the Sun. Thus, when the Earth makes one revolution about its axis relative to the Sun, it is said to be one day. However, the speed of the Earth's travel around the Sun varies so that over a period of one year, some days are shorter and others longer, causing the relative zenith, or noon position of the Sun to vary accordingly. 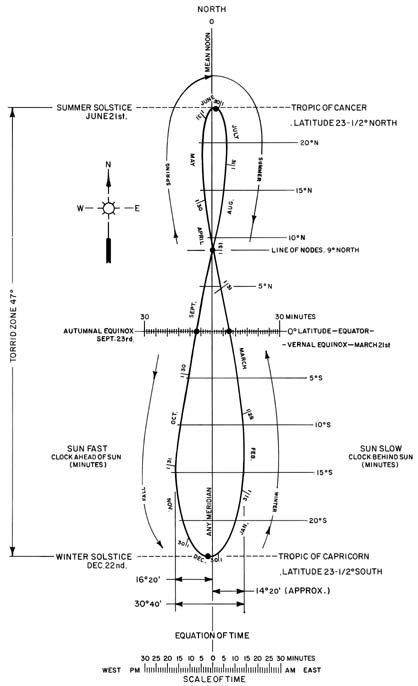 This is what is measured by a Sun Dial, and is referred to as "apparent solar time." called the "Analemma". It reflects the everchanging difference between apparent solar time and mean solar time. This difference is properly referred to as the "Equation of Time" (211,630 bytes). For time measurement purposes, man has taken the "mean" between the longest and the shortest apparent solar days, divided it into 24 equal hours, and thus had "mean solar time." When our clocks say 12 o'clock "mean time", it does not necessarily indicate that the Sun is at its zenith. For the largest part of the year there is a difference between "mean noon" and "apparent noon", and this difference is called the "Equation of Time." One's location in longitude within a time zone also affects the relationship between "apparent noon" and "legal zone time noon." The geographic extent of a given day is determined by the position of the international dateline (180 degrees meridian of longitude) relative to the "mean Sun" or "mean noon." For example, if the international dateline coincides with the "mean Sun" (mean noon), half of the Earth's surface is today and the other half is tomorrow; or yesterday, depending on which half one's position is. Thus, there are two different week days and dates at any given moment, except for an instant each day when it is midnight at the dateline. At this point of time, the same day exists around the Earth. "Zone time" is, or course, the designated time for a given area measuring, ideally, 15 degrees in longitude, having a standard meridian central to the zone. In practice, however, legal zone boundaries are highly irregular and nonconforming. Further distortion of "ideal" zone time occurs where daylight savings time is used. The time of Sunrise and Sunset is influenced by one's position in latitude, due to the 23 1/2 degrees tilt of the Earth relative to its orbital plane. It also varies due to the changing speed of the Earth along its orbit around the Sun. For example, at the equator, the time of Sunrise and Sunset varies 30 minutes over a period of one year, (same as Equation of Time) while the actual daylight period remains nearly constant. The information shown by Geochron is displayed on a flat surface rather than a globe because only a limited legible area is seen when glancing at a globe. Geochron's appearance is intended to be simple, devoid of apparent controls and knobs, and its finish is adaptable to prevailing dŽcor. The instrument is normally hung from the wall. To permit recess mounting, it's depth is based on the 3-1/2 foot spacing width of a standard wall stud. Thus, the Geochron can be surface or flush mounted. Both methods are also designed to prevent accidental dropping of the instrument. The length and height of the Geochron are governed by the fact that one inch of longitude on the map is equal to one hour, and that 75 degrees north latitude and 66-1/2 degrees south latitude cover all areas of time telling importance. and day of the week band system. The world map is an endless Mylar belt upon which are printed three continuous maps of the world, together with legal time zone boundaries and arrows. At the seams, the ends are joined by a special Mylar adhesive tape. The map is translucent and has sprocket holes at the lower edge. It is engaged by sprocket wheels which are part of the roller assembly supporting the map. One sprocket wheel has a molded gear on its underside which is engaged by the map drive motor assembly. The sprocket wheels also engage the day of the week band, which is also a Mylar belt, seven times the length of one world map, and has printed thereon the names of the days of the week. Because of its length, the belt is trained over a series of take-up rollers. The map belt surrounds the Geochron mechanism and frame structure, as well as the day of the week band, so that the day names show through the clear area adjacent to the dateline on the map belts lower edge. When the "synchronous map motor" drives the sprocket wheel, the map belt and the day of the week belt are driven in unison at a speed analogous to the speed of rotation of the Earth. Above the map belt is the time belt. It is also Mylar in order to maintain the same expansion or contraction as the map. Its position is fixed with the top scale indicating daylight savings time and the bottom scale standard time. 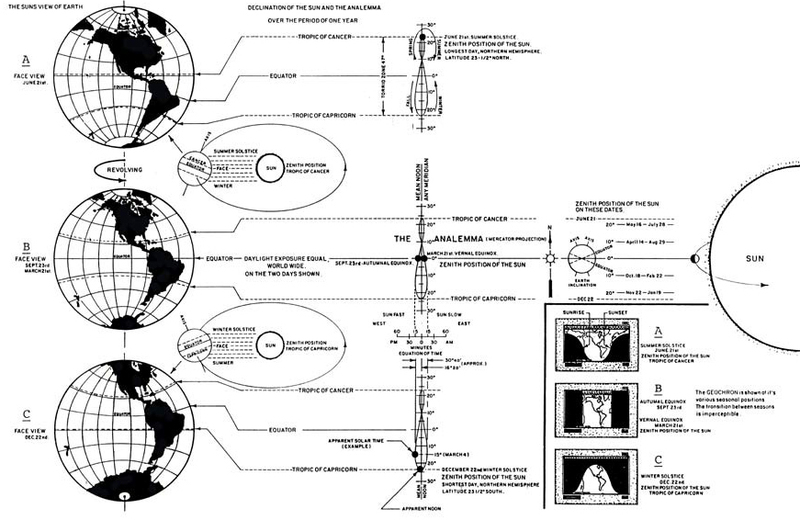 In operation, the arrows on the map point to the time band scale which is calibrated to five minutes. The map moves from left to right while the time band stands still. The "map motor assembly" has a shaft extending downward, at the end of which is a knob. It projects from the underside and extreme right of the Geochron. When pulling down on the knob, the shaft disengages the motor and permits the manual operation of the map drive. This provides manual setting of the map, like setting a watch. Below the lower edge of the map is the "calendar band." It is also an endless Mylar belt provided with sprocket holes engaged by the sprocket wheel on a "mechanism carriage" described hereafter. The length of the calendar belt is the same as the map belt. Its support rollers are pat of the roller assemblies to the left and right of the frame structure. The Sun, Sunrise and Sunset system has a "mechanism carriage" supported by four rollers. Its horizontal movement is governed by a cam held by a spring against a stationary cam roller. This cam makes one revolution per year and imparts a horizontal shift to the carriage equal to 30 minutes on the map and analogous to the "equation of time." As a result of its simultaneous, horizontal, and vertical movement, the Sun button describes a figure eight pattern, crossing the "mean noon" four times. The pattern is called the "analemma." Geochron has a red line coinciding with the 12 o'clock noon marking on the time band. It provides a reference from top to bottom of the map indicating "mean noon." The Sun button's horizontal movement relative to this line indicates the meridian passage of the Sun and the "equation of time." A slot in the vertically slideable actuator plate, in the back of the mechanism, engages a crank roller secured to the aforementioned cam. The slot is slightly curved to compensate for the non-uniform vertical movement of the "apparent Sun". The circular movement of the crank roller drives the actuator plate and provides for the progressive increase and decrease of the declination of the Sun. The mechanism carriage also supports the Sunrise and Sunset delineation reeds. These are two flat spring steel bands with one of their edges contacting a light diffusing panel. Each is secured at its center to a reed carrier, fastened to a shaft. At both ends, each reed is held by a slotted button set into both ends of a Plexiglas lever. Central to the location of its two slotted buttons, the plexiglass lever is mounted to a hub which, in turn, is secured to a hollow shaft. The central reed carrier shaft is supported by bearing inside the hollow shaft, which have a common center and means of support in the mechanism carriage. Both the hollow shaft and the central reed carrier shaft protrude from a main support bearing toward the cam (rear) side of the mechanism carriage. Each shaft has a slotted lever secured to its protruding end. A slot in each lever is engaged by a pin projecting from the vertically slideable actuator plate. The length of the central reed shaft lever is about twice that of the hollow shaft lever, while their respective drive pins, as secured to the actuator plate, move the same vertical distance. As a result, the radial motion imparted to the hollow shaft is grater than that of the central reed shaft. Consequently, as the actuator plate is driven upward or downward from its central position, the reeds bend gradually from straight line into a "S" shape and reverse. The reeds are "tuned" by special fabrication, to bend in the proper places conforming to the plotted curves delineating Sunrise and Sunset on a Mercator Projection map in accordance with Nautical Almanac's Sunrise and Sunset tables. Associated with the reed carriers are blue light filters whose shape has been developed to produce a dark effect to one side of the reeds while the area between the two reeds is illuminated. The distance from the diffusing panel contact edge of the reeds and the plane of the light filters in such that the fixed contours of the filters do not alter the sharp delineation of Sunset and Sunrise produced by the reeds. The Sun, Sunrise, and Sunset mechanism system is driven by a synchronous motor coupled to a gear train which reduces the speed to one revolution per year. There is also a sprocket wheel connected with the gear train. It is located near the calendar belt so as to engage its sprocket holes. Thus, as the gear train turns, the calendar belt moves in proper relation to the changing Sunrise and Sunset, as well as the relative position of the Sun. The gear clutching system permits the clockwise manual setting of the mechanism. The Geochron's Illumination System the Geochron is illuminated from within, in order to display where the Sun is shining and darkness exists. For this purpose there are two Fluorescent tubes with ballasts, starters, and a light switch. The fluorescent tubes, starters and ballasts used in its internal illumination are easily accessed for service or replacement without dismantling the unit since each set is incorporated in a drawer assembly which can be pulled out from the underside of the Geochron, to provide access to these parts. The light switch will turn off the lights but not the clock motors. The previously mentioned diffusing panel and blue light filters are essential to the system for uniform light distribution and darkness effect. Front Panel and Finish the Geochron front panel consists of a metal frame, a glass screen, and adjustable mounting brackets. The metal frame is laminated with decorative vinyl material which is available in the customers choice of several standard colors, which include patterns, such as wood grains, three dimensional textures, and simulated leather finishes. Real wood finishes are also available on the Executive and Boardroom model Geochrons, or as upgrades to other models. The choice of cover and color depends mostly on the effect you want to obtain coupled with your own personal taste. Wood grain and color tone have no effect on the quality and durability of either the wood nor its finish. Company Seven will put samples of the available finish choices on line however, the screen display does not allow a perfect reproduction of samples. It is preferable to see them at our showroom, or you may request samples.